We live in an abundant world. There is an abundance of resources, an abundance of ideas, an abundance of opportunities, and an abundance of possibilities, yet it seems as though as a collective race we are incessantly moving from a deeply rooted sense of scarcity, a profound sense of lack. It seems rather important that we understand why this is the case, as well as how we might as individuals reassess and thereby transcend this paradigm of scarcity in the hopes of engendering a world characterized by an all-pervasive quality of abundance both within and without. Scarcity is, in essence, the fusion of our natural survival inclinations with the processes of our thoughts. When human beings were in our developmental stages, however many years ago, it was quite necessary and applicable to perceive in terms of scarcity because the implements in deriving resources were nowhere near as advanced as they are today. So, we’ve come to evolve in this manner. In the words of the scientist Steven Pinker, “our brains operate perfectly, it is only that they operate perfectly for a world that hasn’t existed in 70,000 years.” When we couple this with our relatively recently developed capacity to think, which is essentially our ability to be aware of that which was and that which potentially will be, we elicit a tremendous amount of fear. This fear is the basis of our scarcity-oriented world. Fear, in this sense, is the fixation upon negatively impactful future events based on negatively impactful events that occurred in the past, and thereby is the very foundation of this quality of scarcity, and it is only in the dissolving of this fear that we may move towards true abundance. We need not change our brain chemistry or discard the capacity to think in order to transcend this fear, rather all we need do is take a gentle breath and direct our attention upon the immediacy of felt experience, for it is only when we are fully immersed in the present moment that we may step outside of our conditioning and evoke this quality of abundance. When we are grounded in the here and now we can then sense the broad spectrum of experiential possibility, and herein we are in a position to actualize those possibilities. 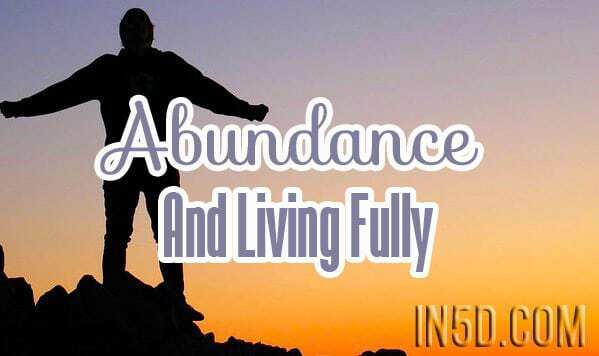 Living abundantly does not entail wishing away all of the adverse circumstances presented to you, rather it implies coming to see these circumstances as challenges necessary in one’s own personal development. If everyone in the world approached difficulties in this manner surely things would look quite a bit differently, for it is our very perceiving of negative situations that empowers them and transmutes them into realities. Where there is fear there can be no deep inward sense of abundance, and that is why it is absolutely imperative to dissipate all fear-based inclinations if we are induce the frequencies of possibility and opportunity. The dissipation of fear is a direct correlation of the embodying of that which exists in the immediate present. There can be no fear when the power of our awareness is centralized in the now. We can bring about a different world. We can move from scarcity into abundance on a societal scale, but this transmutation is entirely contingent on our ability to induce abundance on an individual perceptual level. It will not happen overnight. Incessant practice is necessary here. It will not be easy, but if we continue along this path of self-cultivation and spiritual/philosophical inquiry we can achieve the seemingly impossible. The flowering of consciousness is not just prospect, it is the very destiny of mankind. About the author: Samuel Kronen is a young writer and spiritual entrepreneur whose main focus is that of generating healing and love for all. You can find Samuel of Facebook.